To venture into the jungle and look a tiger in the eye, to marvel at the fantastic monument of the Taj Mahal, to watch pilgrims bathe in the holy waters of the Ganges – moments like these are among the highlights of a trip to India. In this new pictorial work by Axel Gomille, you can experience the magic of this exotic land: a world of contrasts, of ever-changing colours, exotic scents and unfamiliar sounds, that seduces all of your senses all at once. 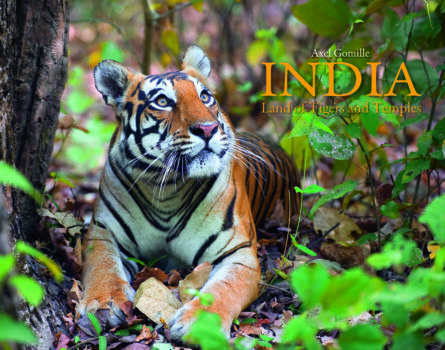 Axel Gomille is particularly intrigued by the unique connection between nature and culture, that is so characteristic of India. Over the past twenty years, he has returned again and again to the subcontinent with his camera to document the rich fauna and its close links to human society. In the jungle he found tigers, sloth bears, elephants and many other animals. In the swamps he observed crocodiles and fell under the spell of the exotic bird life. He visited temples and palaces that recall the splendour of a bygone era, and at a camel fair market in the Thar Desert he was transported back to the Middle Ages. The text and photographs in this book pay homage to one of the most beautiful, most diverse and most fascinating countries in the world. Axel Gomille is a trained biologist. He studied zoology in Frankfurt and in Lakeland, Florida, and works for the German public television broadcaster ZDF as an editor and journalist, specializing in nature documentaries. His film The Tiger Experiment portrayed conservation efforts for tigers in India. To work in the tiger reserves of central India was a defining experience for him as a biologist, but his work as a photographer and author has taken him to many other nature reserves around the globe. Axel Gomille’s photographs have received multiple awards and have been published worldwide, including in magazines such as BBC Wildlife, GEO International and Asian Geographic. This is his fourth book and the first to be released internationally. Further information can be found at: www.axelgomille.com.